“A well-dressed woman jumps from the limo of her mobster boyfriend, gun in hand. She fires a shot into the air and then points the weapon at street punks who are attacking her boyfriend and his driver. Cut to an interrogation scene where the woman, Qiao (Zhao Tao), is now behind bars in prison attire and handcuffs. She’s being interrogated by police, who accuse her of using an illegal firearm. The year is 2001 and it’s the start of a five-year ordeal for Qiao that will drastically alter her existence. 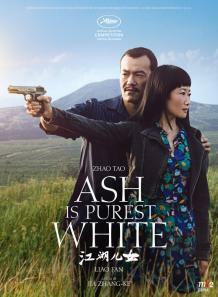 “This head-snapping change in circumstances for the protagonist of Jia Zhangke’s romantic drama Ash Is Purest White occurs at the 44-minute mark of the film, a Palme d’Or contender at Cannes 2018, which continues the Chinese auteur’s reflections on the fast-changing reality of his homeland. In Chinese & Mandarin with English subtitles.